Welcome to the official site for The Jet Harris Movie, “From There..To Here“. The definative Jet Harris Movie also includes the ‘Backstage Pass‘ movie, an extra hour of stories, anecdotes and rock ‘n’ roll history. Jet Propelled ? Terrence “Jet” Harris was undeniably one of THE seminal Bass Guitar players in the UK, and not just because of the work he did in The Shadows, as good as that was. As part of a superb rhythm section with Tony Meehan, he helped lay the foundations for the rock ‘n roll explosion of the early 1960’s. However, Jet’s real influence came in the air of studied and almost impossible levels of cool he radiated as he played his Bass alongside Hank Marvin’s divine guitar sounds; it was the sneer, the way he held the guitar and the blond locks that was captivating, and it was this that enticed a whole generation of Bass players in successful 60’s and 70’s bands. 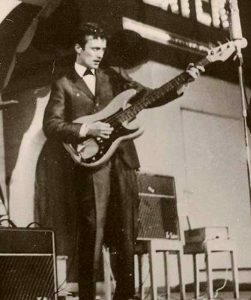 Players like John Deacon, Roger Waters, Roger Glover and John Entwhistle .. not to mention one Mr Paul James McCartney ..all took their cue from Jet Harris. So it’s good that jet finally has a DVD telling the story of his life. The highs and lows, the tragedies, the alcoholism, the comebacks and the final brush-off from The Shadows when they refused to consider him to be part of their 50th anniversary celebrations at the 02 are all covered here, and it makes for compelling, if occasionally sad, viewing. Jet certainly lived the life and was one of the first real UK rock ‘n roll to become a casualty and its all here in this eminently watchable DVD. Great deal again..superb film about our beloved Jet! Fantastic, Jet would be proud, I really enjoyed this DVBD, stuff I had not seen, Jet always says what he means, great bloke, we imiss him, this guy did so much for the pop scene, a pioneer of the electric bass guitar in the UK! A Famous Simple Man You probably would have had to be a teenager of the 60s to appreciate this DVD , but having said that it is a story of human fraility and also endurance .Jet was an icon as a musician ,but seems to have been so working class that the fame was difficult to handle .Seemed a simple man who never wanted much from life ,and in todays world what is wrong with that.A nice man. Very enjoyable Really enjoyed this DVD. As a huge Cliff fan I must admit I didn’t know a lot about Jet. As he left the Shads in the early days I only saw him once, with Tony Meehan, at The Event in 1989. Very candid interview and footage of Jet on stage shortly before he died. A very witty man and enjoyed hearing his annecdotes. Bonus DVD too so good vaue for money. Total brilliance. A review of Jet without the glitz and glamour. Shows where he was and where he ended. Down to earth. Great to see the man in his final years without … Incredible insight into Britain’s first Bass guitarist. Great to see the man in his final years without any bitterness who without his demons would have achieved even more than he did. Boy could he play and quite honestly shaped many guitarists as much as the great Hank.B.Marvin! There are two options to own the Jet Harris movie, From There To Hear. Option 1: You can order the physical DVD here at Buy The DVD Here, Weinerworld.com for home delivery. To buy or watch the movie on Vimeo Video On Demand, you will need to setup a ‘FREE’ Vimeo account. Myself and Jet were talking about working together again, and shortly after we put together Jets 50th anniversary tour. This was to coincide with The Shadows reunion on their 50th anniversary. Jet was dissapointed he did not get to play on The Shadows tour but despite health problems was out enjoying shows and sharing his experiences with the fans. He talked openly about his battles with booze and added his dry humour which had the fans rolling in the isles. Id always called Jet “The black sheep Shadow”. Jet and I recorded “No other baby” and “Back in our rock n roll days”, the lyrics said it all. During this period Jet was also recording what was to be his last album “The Journey” with producer Nigel Hopkins. I had discussed making a documentary about Jet with Mark Windows who also performed at some of the shows. We all agreed to make the documentary and captured some fine moments with Jet. Away from the limelight Jet was also a keen and accomplished photographer which showed another side of him, this was also captured in the documentary.When Jet was awarded the MBE in 2010 this added another chapter to Jets life and of course the film. Although Jets health was not good he carried on to finish the film for his fans. Jet and Billie Davis had discussed making a documentary about Jet’s life on his 50th year in showbusiness. Billie suggested the idea to me, I did not know much about Jet apart from him being in the original line up of The Shadows. I had seen him on stage with The Rapiers but we had never met. Billie also suggested we start filming at The London Palladium where Jet had spent six months in residency with Cliff and The Shadows in the early 60’s. When I arrived at The Palladium I started filming as soon as he walked in with his guitar, so we didn’t get much time to chat. Jet was used to the camera and was interesting, witty and down to earth. Coincidentally, the show was a celebration of 50 years of Cliff and The Shadows, featuring The Rapiers, Billie Davis, the Vernons girls, Jet and Wee Willie Harris. The show was compered by David Hamilton and arranged by a Cliff Richard tribute act. Jet returned to the stage in his raincoat for the finale “Summer Holiday”. He clearly found it a surreal experience. When we visited him to do the interviews on The Isle of Wight Jet would keep going until it was time to roll a cigarette or have a tea break. The interviews are Jet being himself, there was no persona with Jet, he just got on with it. When he needed to get into performance mode though he was a total pro. He would get nervous before shows but once he walked on stage he was a true showman. His album The Journey produced by Nigel Hopkins (Crazy lighthouse records) also features in the film and Jet said of the album “If that’s the last thing I ever do, I’m happy”. In 2010 he was awarded the MBE and was also out doing shows. He was genuinely overwhelmed about receiving the award. Our last day of filming in 2010 was in Soho outside the former Two I’s coffee bar. Jet and I also visited the site of Deso Hoffmans’ studio in Frith street where he had learnt so much from the photographer. We continued with a visit to the world famous Macari’s music shop in Charing Cross road. The shop opened in 1958 and is still there today. Jet bought his first Framus bass there (probably the first electric bass in the UK). The Shadows early Fender Stratocasters were also from Macari’s. Broadcaster Mike Read said that Jets song should have been “Nature boy” and I agree. His interest in nature and photography were his real passion in later life. I tried to cover Jets whole life for his fans and the Limited Edition Bonus DVD contains more on how and why he was in and out of the business over the years. Jet also talked frankly about his problems with alcohol. Jet saw the finished cut two weeks before he died and was very happy with it. I’m glad he did get to see it and I have enjoyed making the film. I’m also grateful for being given the opportunity to do so. My favourite quote from the film has to be ” And Hank Pee’d on the monkey”. If you would like to share memories or postings with other friends and fans check out Jet Harris Movie page on facebook.